I have now been writing this blog for four years, beginning right after the presidential election of 2012. I was a candidate in the May 2012 Republican Primary for the 2nd Congressional District of Nebraska. I campaigned on the platform to “eliminate the deficit.” I lost to the incumbent Lee Terry who was in turn replaced in office by the Democrat Brad Ashford in 2014. 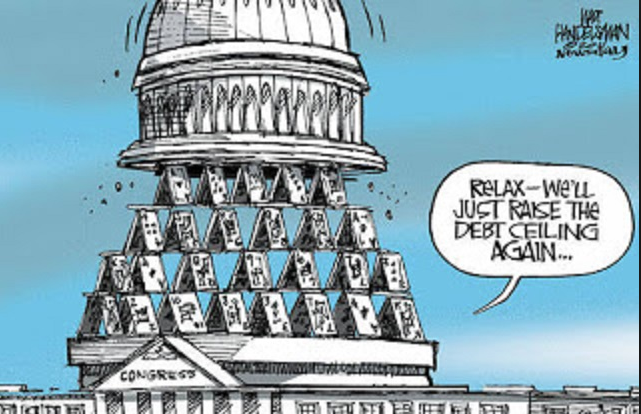 Massive Debt now 75% of GDP, the highest level since right after WWII, and predicted by the Congressional Budget Office to keep rising steadily under current policies. Slow Economic Growth averaging just barely 2% per year since the end of the Great Recession in June 2009. Although the unemployment rate is down to a respectable 4.9%, the labor participation rate is also lower than usual. Faster growth would mean more jobs and better paying jobs. It would also mean more tax revenue to shrink our annual deficits. Tax Reform, lowering rates for individuals and corporations, paid for by shrinking deductions, would do wonders for encouraging business investment and entrepreneurship, as well as encouraging American multinational companies to bring their foreign earnings back home for reinvestment. Conclusion. Much more can be done but this would be a very good start. I have written several posts recently advocating for a Balanced Budget Amendment to the U.S. Constitution. A number of people have responded (on FaceBook) that we don’t really need a BBA, we just need to elect honest politicians who won’t be corrupted by money. Candidates at all levels need money to run a campaign. Candidates will inevitably be grateful to their contributors and, if elected, will want to return the favor. If the donors are publicly identified, then the influence of their money can be kept track of. 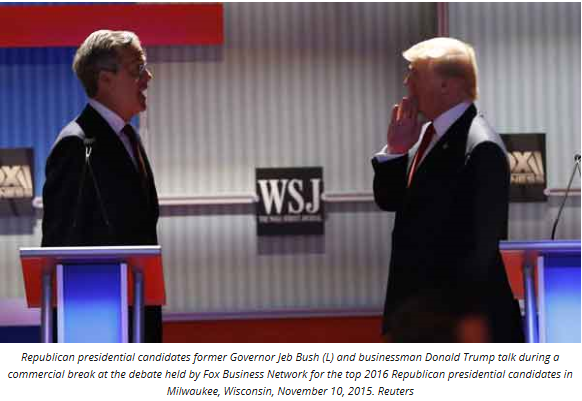 Jeb Bush, in single digits in the Republican polls, has raised far more money than any other candidate. Donald Trump, far ahead in the polls, is near the bottom of the list in money raised. But Mr. Trump has enough money, and media attention, to get his message out. Bernie Sanders, who is rapidly gaining on Hillary Clinton in most polls, has only raised two-thirds as much money as Ms. Clinton. Again, Mr. Sanders is getting his message out, which is what counts. Where dark (i.e. individual donors are undisclosed) money has been so effective is in races for the U.S. Senate which are somewhat under the radar with regard to national exposure. For example, in 2014, in 10 closely contested Senate races, eight of the winners were heavily supported with dark money. It is often suggested that we need an amendment to the Constitution to overturn Citizens United, the Supreme Court decision that allows unlimited political contributions from outside groups. I think that such an amendment would be very difficult to either propose by a two-thirds vote or to be ratified by three-fourths of the states. Congress itself could outlaw dark money by simply passing an appropriate law. On the other hand, enacting a Balanced Budget Amendment is far more feasible. In fact 27 states have already called for a Constitutional Convention to propose such an amendment. Only 7 more states are needed to do this and we’ll be on the way! 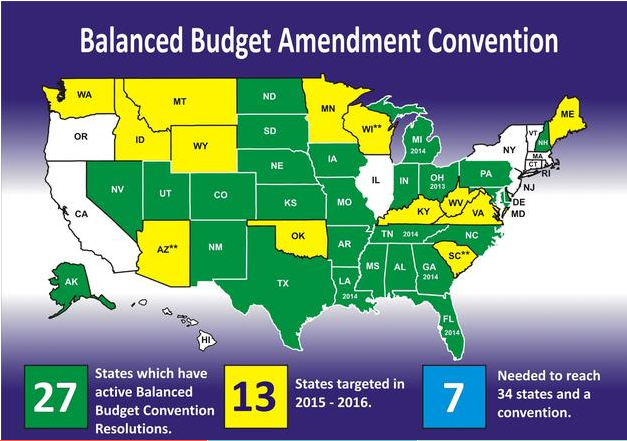 I have been writing a lot lately about the need for a Balanced Budget Amendment to the U.S. Constitution. Our public debt (on which we pay interest) is now over $13 trillion and amounts to 74% of GDP. And this percentage, the highest since the end of WWII, is projected by the Congressional Budget Office to keep growing indefinitely. Eventually this will lead to another financial crisis, likely much worse than the one we’re still getting over with. The annual budget for the National Institutes of Health, which fund medical research, has already been increased by $2 billion for the current 2016 budget year. Major advances in immunotherapy are enabling oncologists to target the surface of cancerous cells instead of using chemotherapy that affects the whole body. But these targeted therapies routinely cost over $100,000 a year per patient. 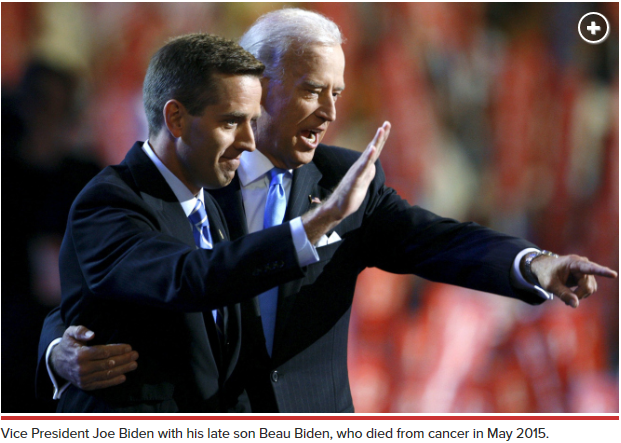 Mr. Biden’s medical advisors are recommending that Medicare start paying for gene sequencing (http://www.nytimes.com/2016/01/14/health/moonshot-to-cure-cancer-to-be-led-by-biden-relies-on-outmoded-view-of-disease.html) to help with these new immunotherapies. Everyone would like to speed up the war on cancer. But we’re already spending billions of dollars a year on it and cancer researchers are making steady advances. In other words, we should leave well enough alone on the cancer front and focus on a much more fundamental problem which is already severe. I am referring, of course, to our excessively large and rapidly growing national debt. Right now interest rates are at historic lows and so our debt is almost “free money”. But this is already starting to change and soon interest payments on the debt will be eating us alive. We’re already in a deep hole but at least we can stop making it any deeper than it already is. This is exactly what a Balanced Budget Amendment will accomplish. Ever since the end of World War II the strength of the United States has guaranteed world order and stability. As Americans we are especially fortunate to live in such a strong, free and prosperous nation. But our future wellbeing depends on the soundness of our economy and the integrity of our financial system. This includes being able to pay our country’s debts in any circumstances. The public debt (on which we pay interest) is now 74% of GDP, the highest it has been since the end of WWII. The Congressional Budget Office, our most objective and nonpartisan source for fiscal and budget information, predicts that the debt will continue to rise indefinitely, presumably until we have another financial crisis, which is likely to be much worse than the Great Recession of 2008-09. It is almost impossible for Congress to address our debt problem effectively. Democrats want to spend more money while Republicans want to avoid raising taxes. The wishes of both can be satisfied only by increasing deficit spending and therefore borrowing more money. Right now this practice is pain free because interest rates are so low. But this situation will not last forever and is, in fact, already starting to change. The Federal Reserve raised short term interest rates by .25% in December 2015 which raises interest payments on the $13 trillion public debt by $33 billion per year. Warding off inflation will require many more such rate increases in the future. The only way to force Congress to act on this problem is with a Balanced Budget Amendment to the U.S. Constitution. 27 States (out of a required 34) have called for a Constitutional Convention to propose a BBA. As more states are added to the list, Congress may decide to propose a BBA on its own. I have discussed previously how to make a BBA both effective and flexible enough to handle emergencies. It is likely that the proponents of a BBA would draft it carefully because it would have to be ratified by 38 states in order to take effect. This is the best argument I can make for a BBA. I will now move on to other topics! Is a Balanced Budget Amendment Compatible with Economic Growth? I have devoted several recent posts to discussing the desirability of a Balanced Budget Amendment to the U.S. Constitution as well as the specifics of how to set it up in an effective yet flexible manner. 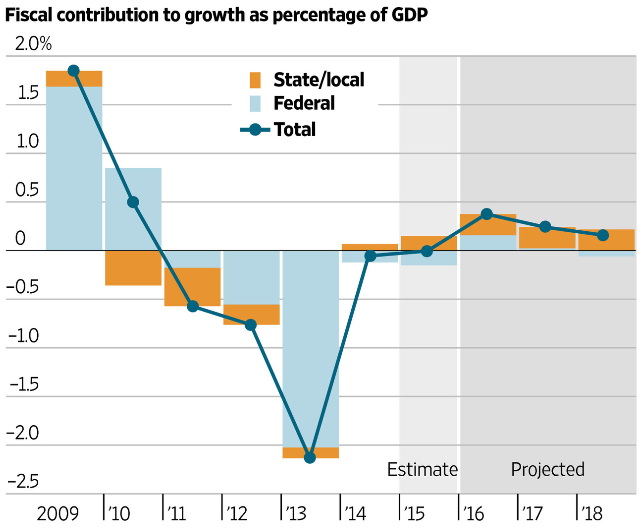 The Wall Street Journal’s Greg Ip has a pertinent article along this line in today’s paper, “Don’t Celebrate the End of Austerity” in which he argues that the recent congressional deal for the current 2016 budget year, which I and many others have criticized as being fiscally irresponsible, will finally contribute to economic growth after five years of overly “austere” budgets. First of all, either through Congressional action or with a Constitutional Convention, a BBA needs to be proposed, and then ratified, to put our fiscal house in order before our rapidly growing debt rises to ruinous levels. A flexible BBA would include a five year phase in period, after ratification, to give Congress time to prepare for it. There will be some pain in achieving this initial balance but it needs to be done and the sooner the better. Secondly, a flexible BBA would also allow for a 2/3 majority of each House to override strict balance. This feature could be used not only for a wartime emergency, for example, but also for occasional recessionary periods where stimulus is needed. Finally, keep in mind that the real goal is not a BBA per se, but rather to put our debt on a downward path over time as a percentage of GDP. This is what a flexible BBA will accomplish. Once initial balance is achieved, it will be relatively easy to hold new debt down to manageable levels. Our current fiscal problem will then be largely solved and we can continue building a stronger, freer and more prosperous future for our country. I have made the case in several recent posts, here, here, and here, as to why we need a Balanced Budget Amendment to the U.S. Constitution. This is a very timely issue since 27 states (out of the 34 required) have now called for a Constitutional Convention to propose such an amendment. Many people have pointed out the difficulty of creating such an amendment which would be both effective enough to get the job done as well as flexible enough to allow for any emergencies which might arise. Prior to the beginning of each fiscal year, the President is required to submit a proposed budget for the U.S. Government in which total outlays do not exceed total receipts. Congress need not adopt the President’s proposed budget but is likewise required to adopt a balanced budget for the coming fiscal year. Congress may pass appropriate legislation to implement and enforce this amendment. For example, official estimates of receipts and outlays could be provided by the Congressional Budget Office. Keep in mind that the real purpose of a BBA is not to establish exact numerical balance for the budget but to put our national debt on an overall downward course as a percentage of GDP. Occasional spending overrides during the budget year, as long as they are reasonable, will not detract from this goal. 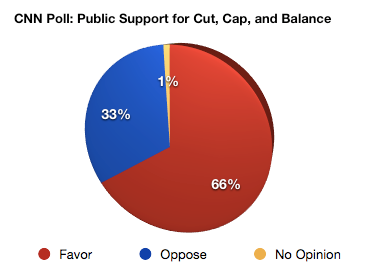 A two-thirds majority vote for balance overrides should be sufficient to accomplish this. Several recent posts, especially here and here, have advocated for a BBA to the U.S. Constitution and pointed out that 27 states (out of a required 34) have now called for a Constitutional Convention to propose a BBA. I pay careful attention to the responses I receive to my posts. Several folks have said that while they support a balanced budget, there are other higher priorities for them, such as ending wasteful and inefficient programs or focusing more on the needs of people rather than being overly worried about budgetary matters. An essential component of a BBA would require the President to submit a balanced budget to Congress each year. So it starts out by forcing the Administration to set priorities. If a new program is advocated, fine, but then it has to be offset by cutting back on existing programs, or else raising taxes. Congress need not accept the President’s priorities but then it has to set its own. It would become a huge priority for both Congress and the President to carefully examine all programs to ferret out waste and inefficiency. There would be an incentive for programs to be shifted to the states, with the flexibility to make them more effective, in return for cost savings. The best way to raise stagnant wages for the middle class is to make the economy grow faster. The best way to grow the economy faster is broad-based tax reform, with lower tax rates across the board, paid for by closing loopholes and shrinking deductions. But faster economic growth will also bring in more tax revenue, therefore making it easier to shrink the deficit and balance the budget. Conclusion: A Balanced Budget Amendment to the U.S. Constitution would have many benefits, beyond “mere” fiscal responsibility. Next question: how should a BBA be formulated to insure that it is both effective and flexible enough to allow response to emergencies?